Secret Daughter by Shilpi Somaya Gowda – A marriage between two doctors, a man from India and a woman from the USA with an adopted daughter. 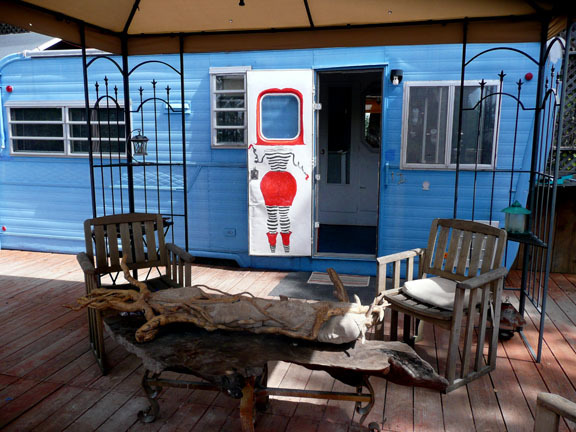 Complications arise they don’t anticipate. Interesting and well written. Information about customs and culture in India. The Postmistress by Sarah Blake – A WWII story from a different angle. A young recent bride is left in a small town in the States while her doctor/husband volunteers to go to London to help during the bombing. She writes a letter to him every day and he writes as he is able. The last letter has a much longer journey. It reminded me of the daily letters I wrote to my husband when he was overseas in the South Pacific for three years during the same war. The Lost Summer of Louisa May Alcott by Kelly O’Connor McNees – A fun book to read with the author telling the story of Louisa May Alcott’s life as she thinks it was in the mid 18th century, feeling the Jo of Alcott’s book,” Little Women” was really Alcott herself. Ruth Curtiss is my mother and a lifelong avid reader. Remarkable Creatures, by Tracy Chevalier: ﻿﻿The remarkable creatures in the title of this book are the fossils which can be found on some sandy beaches and in rocky structures, in this case along the shore of the Atlantic Ocean in England, not far from London. Sometimes they fit together like a puzzle to form what was once a prehistoric creature and they were then given to a museum. The novel is set in the early 1800s and is about 3 sisters and another young woman, all spinsters (the term for unmarried women in this era who are past the age at which they would normally marry). One of the sisters and the other young woman spend their lives in search of interesting fossils. It was a different type of novel, part fact and part fiction. I recommend it. ﻿Note: Ruth Curtiss is my mother. 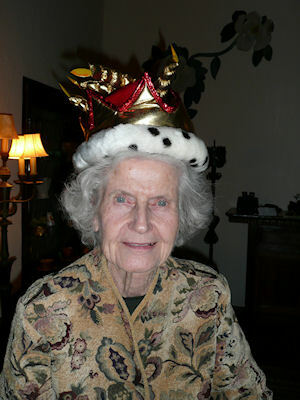 At age 93 she continues to read at a phenomenal pace. Check back for more contributions by her. Actually, so am I, but I think Tesla just might have taken it a little too far. ﻿If you have ever wondered exactly where you stand between normal and crazy, I think the following could tilt your perception of yourself toward normal. He told his story simply, briefly and without embellishments, but there was still a surging of emotion in his voice. “But there was one pigeon, a beautiful bird, pure white with light gray tips on its wings; that one was different. It was a female. I would know that pigeon anywhere. “No matter where I was that pigeon would find me; when I wanted her I had only to wish and call her and she would come flying to me. She understood me and I understood her. “I loved that pigeon. “Yes,” he replied to an unasked question. “Yes, I loved that pigeon, I loved her as a man loves a woman, and she loved me. When she was ill I knew, and understood; she came to my room and I stayed beside her for days. I nursed her back to health. That pigeon was the joy of my life. If she needed me, nothing else mattered. As long as I had her, there was a purpose in my life. “Then one night as I was lying in my bed in the dark, solving problems, as usual, she flew in through the open window and stood on my desk. I knew she wanted me; she wanted to tell me something important so I got up and went to her. 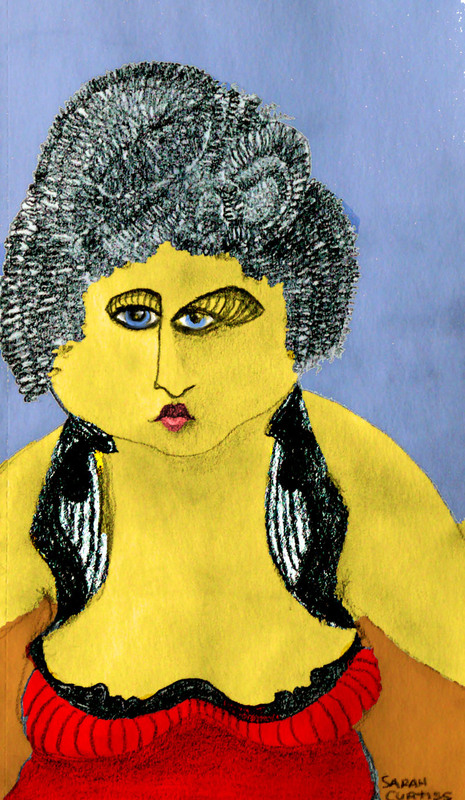 “As I looked at her I knew she wanted to tell me–she was dying. And then, as I got her message, there came a light from her eyes–powerful beams of light. “Yes,” he continued, again answering an unasked question, “it was a real light, a powerful, dazzling, blinding light, a light more intense than I had ever produced by the most powerful lamps in my laboratory. “When that pigeon died, something went out of my life. Up to that time I knew with a certainty that I would complete my work, no matter how ambitious my program, but when that something went out of my life I knew my life’s work was finished. There was nothing more to say. We parted in silence. The talk took place in a corner of the mezzanine in the Hotel New Yorker. I was accompanied by William L. Laurence, science writer of the New York Times. We walked several blocks on Seventh Avenue before we spoke. ﻿﻿Hotel on the Corner of Bitter and Sweet by Jamie Ford held my interest from beginning to ending. It is a story based on what actually happened when Japan bombed Pearl Harbor in 1941 and war was declared. Thousands of Japanese lived in this country and since the government didn’t know which were spys and which were loyal Americans it was decided to pick them all up and put them in camps in fenced in areas with guards for the duration of the war. Although Chinese and Japanese families lived in their own communities within large cities there were many young people who fell in love with someone of a different nationality or race and this is at the core of this novel. A story that was hard to put down. Note: Ruth Curtiss is my mother. At age 93 she continues to read at a phenomenal pace. Check back for more contributions by her. I am about 1/3 through Rushdie’s book and really enjoying it. It is a wonderful, larger than life tale including historical fiction, magic and mythology, family dynasty and family disfunction all set against the backdrop of the independence of India and Pakistan. It was published in 1981 so I’m surprised I haven’t read it before. I just finished a part where the storyteller as an almost-9-year-old boy hides in a large basket of laundry in his mother’s room, accidentally sees her naked (and a bit more) and is traumatized for life. I recently finished The Harlot by the Side of the Road by Jonathan Kirsch. He tells the Old Testament tale of Ham, son of Noah, who saw his father naked and drunk and told his brothers about it. Noah then curses his grandson Canaan, who is the son of Ham, and all of the future descendents of Canaan (the Canaanites) to slavery. Why not curse Ham, the guy who really saw him naked? This is actually in Genesis. Seems to be a recurring nightmare among our species…to see our parents naked or in a compromising position. Is that because of the Noah story or were we, as a species, already freaked out that our parents might be human and have naked bodies back in the days of Noah? I found a blog with a post about the Noah story which was pretty funny. It’s called, Oh Damn, Noah’s drunk and naked again. 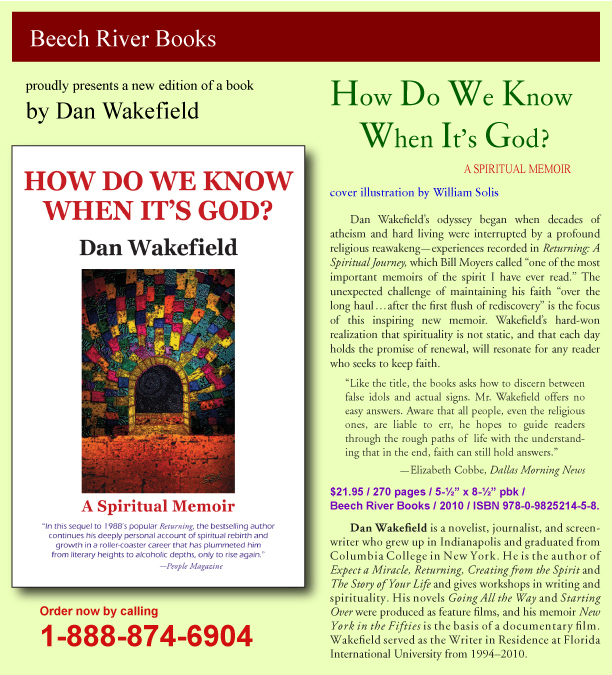 Novelist, journalist and screen writer Dan Wakefield is using one of William Solis’s artworks for the cover of his book How Do We Know When It’s God? See below for a fabulous description of this uplifting book. You can also order this book on-line by visiting http://www.beechriverbooks.com/id36.html or through Amazon.com at http://www.amazon.com/gp/product/0982521456. Decades of atheism and hard-living were interrupted by a profound religious reawakening–experiences recorded in RETURNING: A SPIRITUAL JOURNEY, which Bill Moyers called “one of the most important memoirs of the spirit I have ever read.” The unexpected challenge of maintaining his faith “over the long haul…after the first flush of rediscovery” is the focus of this inspiring memoir. Wakefield’s hard-won realization that spirituality is not static, and that each day holds the promise of renewal, will resonate for any reader who seeks to keep faith. Dan Wakefield is a journalist, screenwriter and best-selling novelist. Novelist, journalist and screen writer Dan Wakefield is using one of my artworks for the cover of his book Creating from the Spirit…my first book cover commission for a book that wasn’t my own! See below for a fabulous description of this uplifting book. You can order on-line by visiting Beech River Books or through Amazon.com. In this passionate, clearly reasoned book, award-winning journalist and novelist Dan Wakefield explodes the many myths often associated with the mysterious creative process. Drawing on examples from religion, philosophy, and literature and exercises such as journaling and right-brain drawing, CREATING FROM THE SPIRIT teaches us that the key to creation is clarity of body, mind, and spirit. Wakefield also challenges the “dangerous nirvanas” of drugs and alcohol as false agents of inspiration. 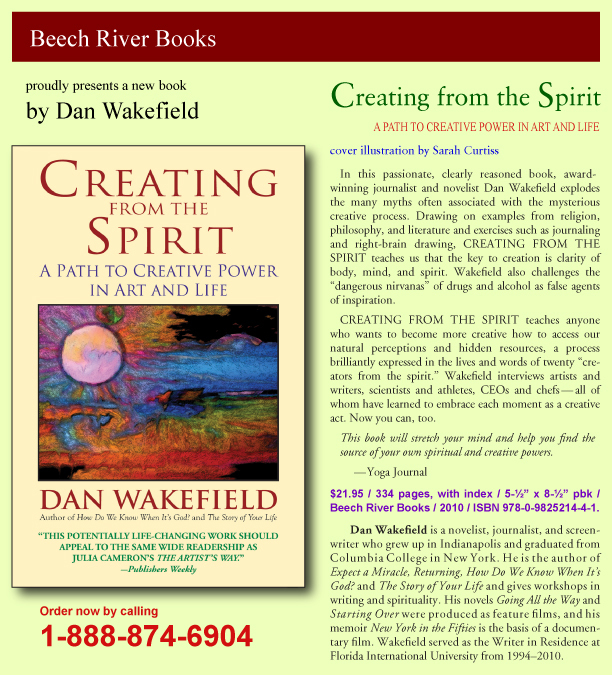 CREATING FROM THE SPIRIT teaches anyone who wants to become more creative how to access our natural perceptions and hidden resources, a process brilliantly expressed in the lives and words of twenty “creators from the spirit.” Wakefield interviews artists and writers, scientists and athletes, CEOs and chefs — all of whom have learned to embrace each moment as a creative act. Now you can, too.